Ok the first thing I need to say is I do not sell these, and if you want to know how to get them I will tell you at the end of this ramble 😉 I know after saying this I will still get that email asking me where how etc to get these masks… oh well. 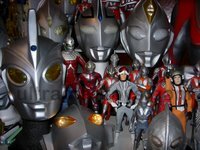 Besides obsessing over Bullmark and Marusan Ultraman toys I do find the time to track down masks of my favorite heroes. Some are fan made, some are licensed products, but most are from stage show costumes. In Japan the heroes make personal appearances to store openings and various festivals. I think a cool part to reinforcing the fact that these superheros are REAL … something I think missing from the US. I mean I suppose you can go to a Six Flags Park and meet Batman… that would be the closest we have to this nowadays. Anyways sometimes for whatever reason while surfing Yahoo Japan I find these for auction.. and if I’m lucky with the Toy Karma , I win them. They show some signs of wear most of the time.. have beat up wires inside ( where the eyes use to light up etc ) and sometimes have a funky smell ( ie sweat ! ) Some are raw pulls form the mold, meaning they need to be painted… but for me nothing beats the sensation of holding a 1:1 scale mask. Not just a toy version but an actual size piece of history. The next thing is, have a put one on ? Yes, I have and let me tell you, it’s very hard to see out of them, and it gets hot real fast… and for me I did not enjoy the claustrophobic sensation. So as much as I would like to walk around the block in a full suit it’s not for me ;-P By the way, it is not legal to sell these in Japan.. seriously… so just keep that in the back of your mind. Again, I show these as part of my collection/museum.